Note: Environments have been deprecated since June 2016. All accounts created since March 20, 2017 have Workspaces instead of environments and all accounts that have been migrated to the new platform have had their environments converted into Workspaces.Read more about Workspaces here. 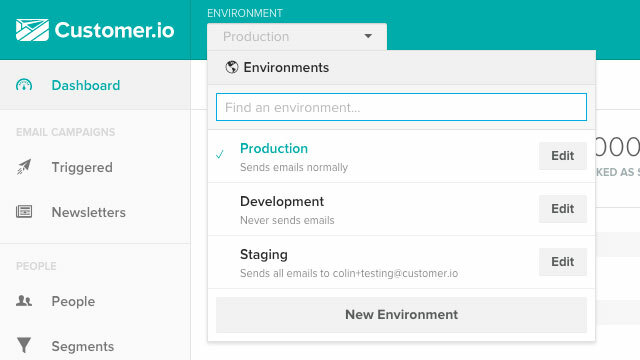 Environments in Customer.io make it easy for you to test emails and sending logic before putting data in to the production system. What do all environments have in common? In fact, it's probably more helpful to talk about what's different between environments. Campaign stats or the sent/draft status of a Newsletter. A note about newsletters When a newsletter is sent, it is sent only to the matching people in the current environment. An unsent draft of the newsletter will exist in the other environments. In the top left of the app, you might notice the environments drop down. 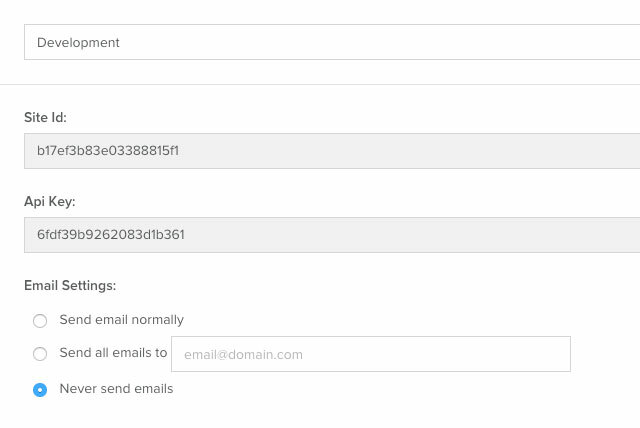 In the environment settings you'll see the site id and API key for that environment. You can also rename or delete the environment. In "Development", never send an email. In "Staging", send an email to an internal team member. In "Production", send emails normally. If you have any questions or thoughts on on how to improve environments, please let us know.